I just love those New Orleans ladies – and here’s another one who only seems to have made just a single 45. 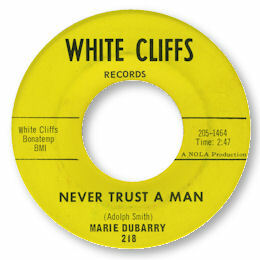 Marie Dubarry gives a spirited performance on Never Trust A Man. This is a typical Crescent City blues ballad – great horns as you would expect, a fine pianist likewise – and strong lyrics on this cautionary tale. You’ve now been told girls - in no uncertain manner!